Carlo Portelli was born at a still to be determined date in Loro Ciuffenna in the Val D'Arno outside Florence. He died in Florence itself in 1574, and although he painted two altarpieces for his native town, his career is properly defined as purely Florentine. "apparati", or ephemeral decorations for the wedding of Cosimo de'Medici. Between 1544-46 he is inscribed in the Arte dei Medici e Speziali, or guild that included in Florentine painters. From Vasari's Lives of the Artists it is known that Portelli was very close with Francesco Salviati during his extended period in Florence in the mid 1540's, and he was the only Florentine artist to adapt Francesco Salviati's Roman-based style based of freer invention to the venerable Tuscan mode based on firm drawing. Portelli's art represents a fulfillment of the calmer High Renaissance ideals in the Ghirlandaio tradition mingled with the more extravagant and elegant ones of Mannerism derived from Rosso, Pontormo and Salviati. Portelli's first documented surviving work is the altarpiece of the Trinity and Saints of 1544 surviving in Santa Felicità. It is likely too that the Crucifixion with Saints Antonio Abate and Francis from S. Michele delle Trombe (i.e. S. Elisabetta della Visitazione), now in the Museo di San Salvi, dates around this period in the 1540's. His properly mature phase comes in the 1550's and there are a small number of dated altarpieces which allow us to monitor his development. These are the Immaculate Conception formerly in the Santa Croce Museum, which is signed and dated 1555, now in deposit and not currently on public display, and the altarpiece in Santa Maddalena dei Pazzi in Florence - the first chapel on the right from the entrance of the Rutini family - a large round-top altarpiece signed and dated 1557 on the panel support of the Martyrdom of S.Romolo. The altarpiece of the Nativity in the San Salvi church can also be safely dated to after 1555 when the site was newly consecrated. Looking ahead to the last decade of his life the Immaculate Conception, formerly in Ognissanti, now in the Accademia, carries a date of 1566, while his last securely dateable surviving effort is an altarpiece at Olmi di Borgo San Lorenzo of the Verification of the True Cross, dated 1569. 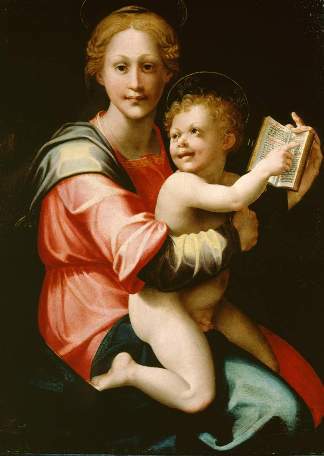 In addition to morphological details like the pursed lips and distinctive upturned nose of the child, the attribution of this private painting to Portelli can be sustained by an examination of the technique in relation to his few secure altarpieces. The plain surface evokes marble in its smooth, enamelled finish, as in Portelli's work, and distinguishes this effort from the paintings of Rosso - the artist to whom this panel was formerly attributed. The large planes of acidic colour are perfectly consonant with his paintings are well as those of Pontormo, Bronzino and Francesco Salviati, and so is distinctive to mid-sixteenth-century Florentine painting. The tight goldsmith's curls of the hairstyles are equally frequently found in painting of this period. The firmly drawn contours are also classically Florentine and typical of Portelli's style and put the attribution beyond doubt. Portelli's undated work is difficult to place, but this is certainly a fully mature and not an early effort. It fits well with the relatively calmer and profound altarpieces datable to the mid -1550's, such as the ones formerly in the Museo di Santa Croce and in the church at San Salvi, and can probably be comfortably placed there. It was in this period he started to shed some of the influence of Francesco Salviati on his style and to achieve something more personal and distinctive that, nonetheless, has much in common with the artists of the Ghirlandaio workshop such as Michele Tosini and Francesco Brina, not to mention the, by then much venerated Andrea del Sarto. By the 1560's, however, Portelli's style becomes yet more extravagant with the forms tending to be smaller and more pinched. This Virgin and Child represents a major rediscovery not just for Portelli but Florentine Mannerist art in the mid-sixteenth century, that is in the decade Vasari first published his groundbreaking Lives of the Artists.